Finally, the ultimate toolkit for player positioning has arrived! Getting players to stay disciplined and in formation can be a major headache, whatever level you coach at. Now this problem is solved with the powerful grid based training system revealed in Coaching Team Shape in the 4-3-3. While focused on the 4-3-3, the explanations and drills in Coaching Team Shape in the 4-3-3 can be applied to a variety of formations, including the 4-2-3-1, 4-4-2 and 3-5-2. So whether you coach youth players or more advanced teams, Coaching Team Shape in the 4-3-3 can dramatically improve your players’ spatial and positional awareness, raising team performance across the pitch as a result. It’s hair tearing stuff. Rather than keep their position, time and again you’ll see inexperienced players charging to win the ball, leading to frantic outbreaks of clumsy hit and run soccer. Not only is this lack of discipline frustrating to watch, it also creates huge gaps for the opposition to run into and score. It’s no wonder so many games are thrown away because over enthusiastic players won’t stay in formation. Coaching Team Shape in the 4-3-3 shows you how to give players the positional discipline they may be lacking with grid based training. Not only do grids force players to maintain team shape, but it also helps to improve their decision making, passing angles and gives them a deeper understanding of how to move the ball quickly up the pitch. Player spacing is one of the biggest problems in youth soccer. But it can create problems for players at a more senior level too. So if you to foster a team of disciplined players that know how to stay in their pens, Coaching Team Shape in the 4-3-3 gives you the perfect system to do it. 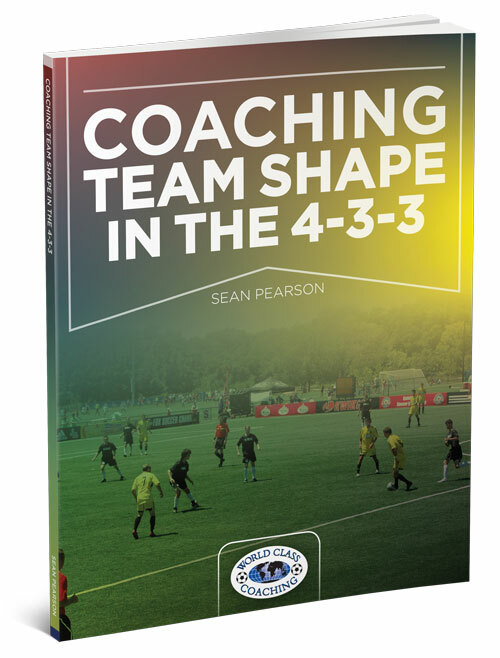 Coaching Team Shape in the 4-3-3 Formation is born from its author Sean Pearson’s lifelong passion for coaching. He grew up watching his father’s vast collection of Liverpool games from the 1980s onwards, a period during which they were England’s most dominate team. From watching and analyzing their style of play, Pearson developed an appreciation for the benefits of smoothing passing and playing as a team. 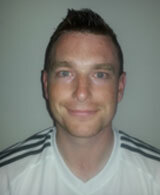 Pearson first started coaching at the young age of 16, helping to train his local team. This continued while at Oxford Brookes University, where he helped to train the university side. Upon graduating, Pearson continued to pursue his passion for coaching at Sheffield United’s Academy, coaching junior sides up to the age of 14. During his time at Sheffield United, Pearson was able to observe professional level coaching firsthand and gain his UEFA B License. Pearson then decided to take his coaching education abroad, moving to the USA in 2009. It was here that Pearson crystallized his specialty in developing systems of play, which could be used by coaches at every level. He also further developed his philosophy in sharing possession and make it easier for each other with lots of movement off the ball, combination plays and penetrating runs into the box. While in America, Pearson also expanded his coaching qualifications, gaining an NSCAA Premier Diploma and Director of Coaching Diploma. He currently coaches the U20 Men’s team and U15 Boys at the FC Philadelphia, where he is also responsible for staff development. Coaching Team Shape in the 4-3-3 provides a complete system for training players in spatial awareness, composure and drilling them in the responsibilities of their position. The drills are especially effective for educating young players due to their repetition of game like scenarios and focus on the fundamentals of effective team play. 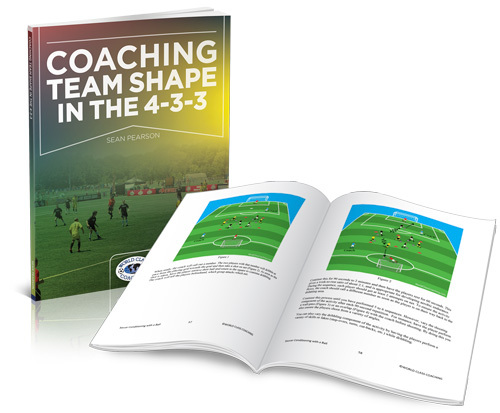 Coaching Team Shape in the 4-3-3 provides a complete set of grid based drills and tactical insights for keeping players in position and supporting the team shape. This makes it particularly valuable for coaching youth or inexperienced players who lack a fundamental understanding of their position’s roles and responsibilities. Coaching Team Shape in the 4-3-3 offers a highly effective system for training young players in spatial awareness and the vital need to stay in position. Its grid based drills can also be equally effective for training players at an amateur, college or an even higher level who need to be more disciplined in keeping team shape. WORLD CLASS COACHING is recognized globally for the quality of its soccer coaching resources, which are used by over 40,000 soccer coaches from around the world. We wouldn’t be offering you Coaching Team Shape in the 4-3-3 unless it achieves our exceptionally high standards. However, if you are not 100% satisfied with the quality of Coaching Team Shape in the 4-3-3 after six months then please contact us for a no quibbles refund. If you’re starting to wonder whether the only way to keep players in position is with a ball and chain, Coaching Team Shape in the 4-3-3 is the training system you’ve been waiting for. Its drills are carefully designed to ensure players get a better understanding of where they need to be and why. Its progressive yet repetitive approach to training, with a replication of real game scenarios, will also ensure that the improvements in spatial and positional awareness translate smoothly into real games. Ultimately, the benefit of practicing the tactics and drills in Coaching Team Shape in the 4-3-3 is that players are more disciplined and team shape is maintained. This will give you a clear winning advantage over teams that charge after every ball and cause their formation to collapse as a result. P.S. Coaching Team Shape in the 4-3-3 provides a comprehensive grid based training system for improving spatial and positional awareness. It’s drills will give your players a deeper understanding of their roles and responsibilities so they stay in position and maintain team shape, improving the entire team’s performance as a result. 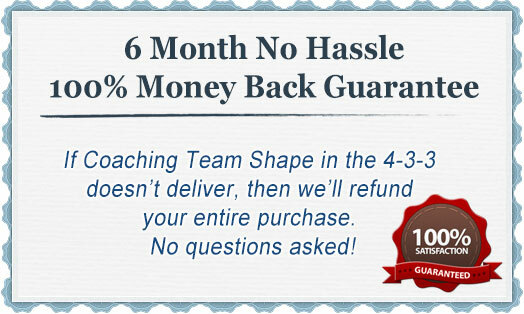 P.P.S If you are not 100% satisfied with the quality of the soccer coaching resources in Coaching Team Shape in the 4-3-3 after six months then we will refund your purchase in full, no questions asked.